The bike is my hybrid - a Gary Fisher Utopia. 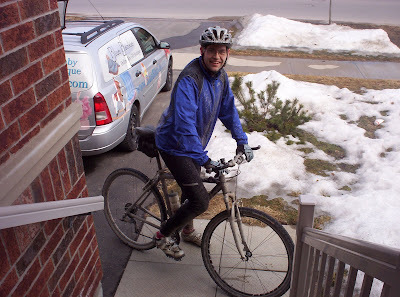 It's pretty old, about 7-8 years now, but I still love this bike... perfect for the wet and muddy gravel roads out in the country just minutes away from my house. +15C, sunny... a bit windy, but I barely noticed. Just a joy to be back outside. I even love the mud (well not the mud between my teeth or in my eyes, but the rest of it was a joy!). And there's something cool about biking by a ski hill with people still skiing on it. I felt really great today. All those hours in spin class and on the indoor trainer have paid off, I'm way ahead of last year at this time. No fatigue, just strong start to finish, and I was able to really attack the super-hill that makes this ride worth doing.